This delicious soft bread roll with buttery crumb filling inside is one of my favorite buys from our neighborhood bakery when I was little. We used to have it for afternoon snack and sometimes for breakfast, too. I had this recipe for years and have tried it once before, it was a fail ( like most of bread recipes I tried before); but when I read the recipe again, I find it easier now than a few years ago..that is not to say that I’m an expert now in bread making…I still have a lot to learn (and I’ll share everything here). I use instant yeast; the kind that you can mix directly with flour and doesn’t need to be activated with warm water and anymore. Make sure that your milk mixture is lukewarm when you add it to the flour, it’ll make the dough much easier to work with. I use the same dough and fill it with chocolate to make pain au chocolat ( I’m still struggling with the puff pastry). lay on baking sheet, seam side down. At this point I like to put it in the fridge for it’s second rise..
Spanish bread is filled with a buttery sweet bread crumbs filling...perfect for coffee break. Combine milk, melted butter, sugar, eggs and salt. Blend well. Sift 3¼ cups of flour in another bowl, add yeast, stir then add the milk mixture. The dough will be sticky and a little wet. Spread ¼ cup of flour on a clean work surface. Transfer dough to the floured surface and knead until smooth and elastic ( about 8-10 minutes). Keep a small bowl of flour beside you for dipping your hands in when the dough gets sticky. Just continue kneading and eventually the dough will stop being sticky and will feel soft and elastic. Form dough into a ball and place into a greased bowl, cover and let rise at room temperature until double in bulk. Punch down risen dough then divide into 16 equal portions. Roll each dough into small rectangle, brush with melted butter then spread with some filling. Roll up and place on a greased baking sheets seam side down. Do the same for the rest of the dough. Sprinkle the top of the rolled dough with more of the filling. OR, you can do the second rise (or proofing) in the fridge. Cover the baking sheet with plastic wrap and immediately put in the fridge overnight. When you are ready to bake, take it out from the fridge; let it come to room temperature, uncovered ( it'll take about 2 hours) before baking in the preheated oven ( 375F degrees). 11 Responses to "Spanish Bread"
hi! why was the bread a little bit hard after baking? i baked it for 20 mins 375F. what did i do wrong? and i realized that my douch was so elastic it slightly comes back to its form when i use the rolling pin. please help! maybe if you add cinnamon to sugar and butter spread, it will taste even better? Another favorite of my family! thanks for sharing! I love the look of these bakes! So delicious! Have not tried the proof in fridge overnight method yet but certainly looks like you are having great results! One of my favorite panaderia treats! Great recipe! Oh wow these look like the perfect weekend breakfast. I only just recently learned that you can leave the dough in the fridge overnight. Such a revelation! 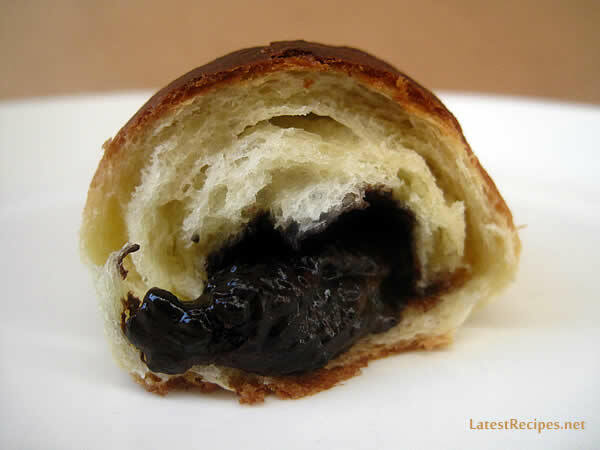 I absolutely love pan au chocolat so I’ll definitely be giving these a go. Maybe I’ll do half sugar half chocolate. OH WOW! This bread could possibly be the most amazing…that chocolate just oozes yumminess.